You have to wonder… In a country like North Korea where the nation is stuck 1950s time warp and Western influences have officially not been allowed in… Why the 2002 film Bend It Like Beckham? Why now? The 2002 film starring Keira Knightley, Jonathan Rhys Myers and Parminder Nagra aired Dec. 26 — a break from the regular programming of news, documentaries and soap operas in North Korea, where Western films are largely off limits. “This was the first Western film to be broadcast on North Korean TV, and as well as football covered issues such as multiculturalism, equality and tolerance,” British Ambassador Peter Hughes told The Associated Press from Pyongyang, where his embassy helped arranged the Boxing Day broadcast. I get it. Soccer can unite the world, teaches sportsmanship, crosses boundaries of nation states, blah, blah, blah. I can understand why the British government would choose this movie to develop ties with North Koreans. What I’m curious about is the South Asian hyphenated identity and pop cultural references. I would think that in a nation sheltered the way North Korea is, that a lot of these subtle nuances would be totally missed. In a nation where immigration simply doesn’t exist, how much of the immigrant experience story line did the North Koreans actually understand? A couple of weeks ago, I had the pleasure of attending one of the most bass booming dance frenzy inducing parties I’ve been to since moving to the Bay area. Held at the dope new venue Public Works, it was a record release party for Trigger the latest out of the electronic/hip hop/dubstep/desi beat making duo, Sub Swara. Originating from a NYC club night, Dhruva Ganesan and Dave Sharma have turned Sub Swara into an electronic dubstep music touring machine. Performing that night were also San Francisco’s own Surya Dub DJs Kush Arora, Maneesh the Twister, Jimmy Love and DJ Amar. Almost all of these folks are tied in with the sound barrier breaking Dhamaal Soundsystem. But enough about the party that you missed. Let me give you something to listen to on this Music Monday. 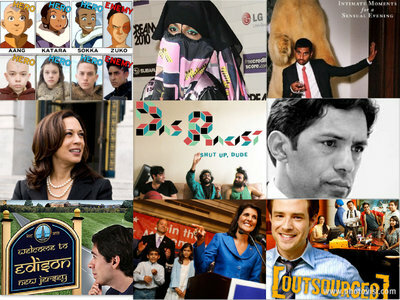 Check out the Triggers Mixtape Volume 2, opening up with a track co-writ by Dead Prez. That’s right, it’s a Dead Prez meets Sub Swara – an unlikely combo but somehow it works. Also check out minute 9.00 for the Ceelo remix, my personal fave. The above Mixtape is the second in what I can only imagine to be a series – bookmark the Sub Swara soundcloud page to keep track of other mixes that may be coming from their crew. Just in case you were the OG type, below you can listen to Trigger in it’s entirety and original form. I’ve never been a huge fan of electronic music (though I did attend my fair share of raves in my college days) but I find the music coming out of Sub Swara and their associated DJ crew different. There is more bass, more beats, amazing obscure dancehall and reggae finds that blend seamlessly with bhangra and deep bass beats. I’m a big fan of dubstep and love how this team of musicians can spin to take listeners on an audio adventure. For today’s Music Monday, I want you to imagine this: A big gritty cauldron. Throw in a pork eating Muzzie. A ukulele. A pair of cowboy boots. Stir in a dash of lo-fi, put in a pinch of sultry attitude, and toss in a little bit of “pew, pew.” What do you get? 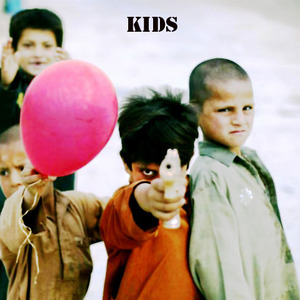 You get the The Kid (of Sunny Ali and The Kid) with a new EP album aptly named Kids. Abdullah Saeed’s (aka “The Kid”) solo project and released on the Poco Party label, Kids maintains the cowboy feelings that you get when you listen to a Sunny Ali and The Kid album, it’s just now it has a Hawaiian ukulele twang. It’s complicated to describe yet oddly simple. Just listen to it below. And after you listen to it, you can download it here at Sunny Ali and the Kid’s Bandcamp site for free – consider it my Chrismahanukwanzakah present for you. So there you have it. It’s an album by The Kid named Kids written from the perspective of a kid. Don’t worry, Sunny Ali ain’t mad at The Kid for breaking off on his solo project – in fact the duo just performed this past weekend in New York City. Follow Sunny Ali and The Kid’s facebook page for their upcoming tours and albums and you can read Abdullah’s latest adventures with music over at MTV Desi. In the meantime, I now can’t stop daydreaming about how I want this for Chrismahanukwanzakah. Thanks, Kid. Is It The Desi Dougie? Is The Dougie a Desi dance move? This is the type the hard hitting questions asked only here at Sepia Mutiny. Evidence one, Brown people in kurtas & salwars dancing The Dougie. Posted on December 16, 2010 by V.V. Are the island’s diasporas to be seen as a source of remittance, a threat, or legitimate sites for political engagement and critique? There is no such thing as ‘the Sri Lankan diaspora’. Sri Lankan communities exist in the plural. And yet, nearly thirty years of conflict have rendered a nation with multiple minority communities and religions as though it has only two groups. If you generalise about what you read at all (and most people do), you are likely to believe that Sri Lanka’s Sinhalese majority and Tamil minority are pitted against each other, not only inside the country but in diasporas all over the world.